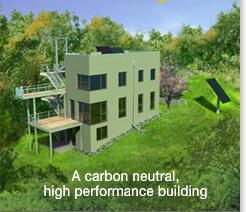 Click here to view the Channel 5 TV coverage of the Passive House in the Woods. Just to be accurate, the waste-water heat recovery unit in the basement does not heat or cool the home, it pre-warms cold water going into the hot water system to reduce the need for water heating. Been following the progress of your home construction through this website, and just watched the Channel 5 story. Awesome coverage!!! Being an automation techie it’s fun to see all the controls and home automation used to make everything work. If possible, keep me posted when it will be open for tours – I’d love to see it! !